Pacifica is a specialty fabrication and refurbishment company operating in the mass transportation vehicle industry. Highly skilled workers and an experienced management team bring unique talents to transportation projects requiring the extra skill and quality control that operator/owners responsible for public safety require. Various one-off prototype projects, including a replica historic trolley refurbishment and fabrication. 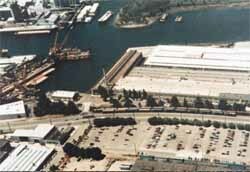 In 2003, Pacifica diversified its transportation work initiating its Green Emissions Division. This department specializes in retrofitting school and transit buses and other diesel powered equipment with high performing filter and catalyst technologies capable of reducing harmful diesel emissions by as much as 95%. The technologies we install are verified by both the EPA and the California Air Resource Board. For your transportation projects requiring efficiency, timeliness and the highest quality standards, Pacifica is an ideal partner and service provider. Copyright © 2003 Pacifica. All rights reserved.